How and Where to Buy Anoro Ellipta Online? 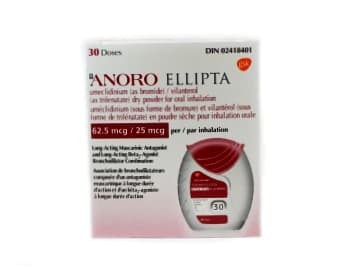 Our Canadian Dispensing Pharmacy offers Anoro Ellipta at amazing prices with a valid prescription. Canadian Pharmacy World carries brand and generic medications from Canada and other countries around the world. For more information and further details, please call Customer Service at 1866-485-7979. Are there Alternative Names for the Brand and Generic Anoro Ellipta? The brand Anoro Ellipta comes from Canada and UK manufactured by GSK. There is no generic available for this medication. Our Canadian Pharmacy also carries Breo Ellipta and Arnuity Ellipta. What Dosages and Forms is Anoro Ellipta available in? Anoro Ellipta is available in the strength of 62.5mcg/25mcg/30dose inhaler. Anoro Ellipta (Umeclidinium Bromide/Vilanterol Trifenatate) is an inhalation powder containing a combination of Umeclidinium and Vilanterol. Umeclidinium is an anticholinergic and Vilanterol is a bronchodilator. This medication is used to prevent and control the symptoms caused by COPD. Both these drugs work by relaxing the muscles around the airways in the lungs so they open up to make breathing easier. Controlling the symptoms of breathing problems helps you to stay active. The recommended dose of Anoro Ellipta is one inhalation taken once daily. This inhaler should be used at the same time every day to get the most benefit from it. What are the Possible Side Effects of Anoro Ellipta? Are there any Precautions and Drug interactions for Anoro Ellipta? You should not use Anoro Ellipta if you are allergic to Umeclidinium, Vilanterol or milk proteins. Before you start taking this medication, talk to your doctor about your medical history and about all the medications you take including OTC and herbal medications. Anoro Ellipta should only be used in people with COPD and should not be used to treat asthma. This medication should not be used during pregnancy unless it is clearly needed. It is unknown if this medication passes into breast milk. Anoro Ellipta should not be given to anyone under 18 years old without medical advice. Anoro Ellipta should be stored at room temperature away from heat, light and moisture. The inhaler device should be kept in the sealed foil tray until ready to start using it.